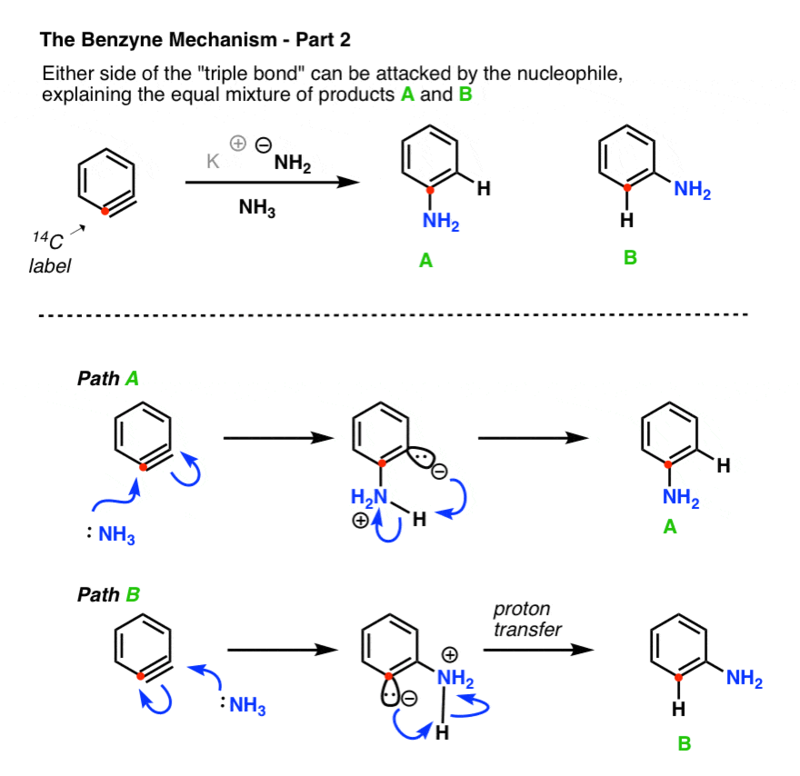 In this post we’ll discuss nucleophilic aromatic substitution, but with a new twist; a nucleophilic aromatic substitution that passes through a strange-looking intermediate called an aryne (a generic term for a family of molecules that includes benzyne). Previously [see: Nucleophilic Aromatic Substitution] we saw that electron-poor aromatic rings containing a leaving group can undergo substitution with electron-rich nucleophiles. We saw that the mechanism proceeds through addition of a nucleophile to the aromatic ring (via an electron-rich intermediate) followed by loss of a leaving group, in a process sometimes called, “addition-elimination”. 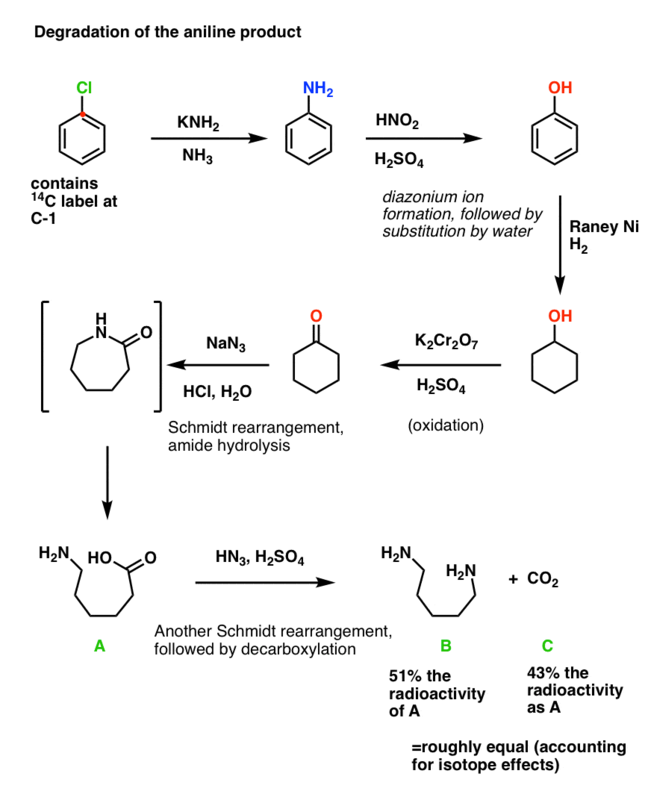 Although the “addition-elimination” mechanism for nucleophilic aromatic substitution has been known since at least 1902 (when Meisenheimer isolated a key intermediate) , it became increasingly clear in the first half of the twentieth century that certain reactions classified as “nucleophilic aromatic substitution” appeared to proceed through a different mechanism altogether. 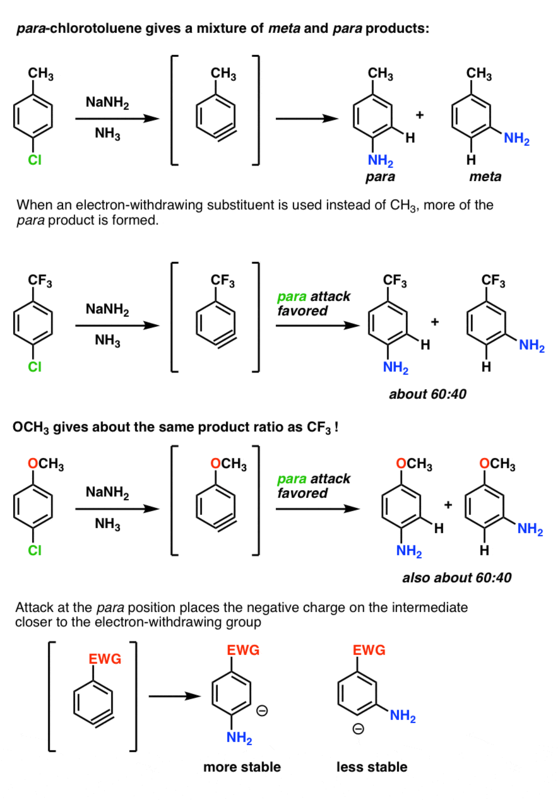 An addition-elimination mechanism here doesn’t seem right, considering that nucleophilic aromatic substitution reactions with far stronger electron withdrawing groups (e.g. NO2, rather than Cl) require higher temperatures and longer reaction times. Another observation was that no reaction occurred under these conditions when the ortho- positions were attached to alkyl groups. A hydrogen is necessary at one of these positions for the reaction to proceed. A second observation was that in the case below only the ortho- and meta- products formed, and never the para– . Various intermediates were proposed to explain these results, but then in 1953 John D. Roberts (then at MIT) nailed it by publishing one of the most elegant chemical experiments of all time. 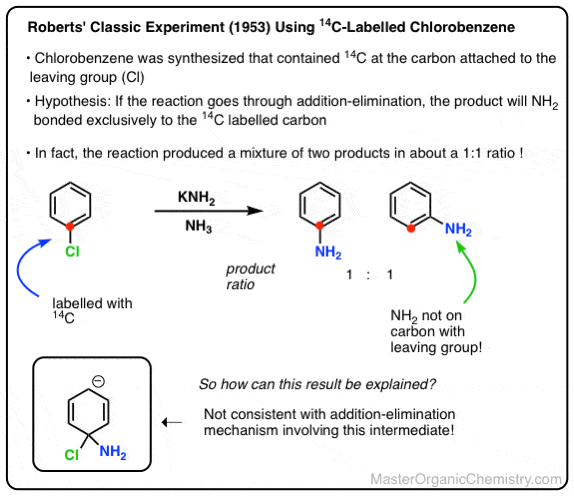 He and his team synthesized chlorobenzene but with a special difference: the carbon attached to the chlorine was a radioactive isotope of carbon (14C), not carbon (12C). Roberts’ group carried out the reaction under conditions reported previously, and found that about 50% of the product ended up with the NH2 attached to the labelled carbon, and the other 50% had the NH2 on the carbon adjacent to the label. This is not consistent with an addition-elimination mechanism! In fact, the roughly 50:50 ratio of products implies the involvement of a symmetrical intermediate which is attacked equally on either side. Roberts’ proposal – which has stood the test of time – was the involvement of a short-lived intermediate bearing a carbon-carbon triple bond: “Benzyne” ! At first glance, this seems crazy. A triple bond in an aromatic ring? Well, it’s not quite a true triple bond in the way that we’re familiar with (i.e. with alkynes). Instead of an overlap between two 2p orbitals (as in an alkyne) the “triple bond” is formed through overlap of two adjacent sp2 orbitals in the plane of the ring (i.e. at right angles to, and completely independently of, the aromatic pi system). Since these orbitals actually point away from each other, the overlap between them is poor, resulting in a “triple bond” that is actually very weak. The strain energy of benzyne has been estimated to be about 50 kcal/mol – more strained than cyclopropane (28 kcal/mol), and only slightly less strained than cyclopropene (54 kcal/mol). An intuitive way to think about it is to imagine the involvement of two resonance structures (far left and far right, below) that make strong (and equal) contributions to the overall resonance hybrid, such that both carbons can be considered “electrophilic”. [A more rigorous way to treat it is from a molecular orbital perspective – a weak bond results in a low-energy LUMO, and therefore a lower energetic barrier to attack by nucleophiles]. However strange it might look, the benzyne intermediate explains all of these important observations, and more. In the first step (elimination) a strong base removes a hydrogen from the carbon adjacent to that bearing the leaving group, resulting in an elimination reaction that forms the triple bond. This explains why no reaction occurs when both positions adjacent to the leaving group lack hydrogen! In the second step (addition), attack of the can come at either side of the triple bond, resulting in about a 1:1 mixture of the product with NH2 attached to the labelled carbon (A) and NH2 adjacent to the labelled carbon (B). When a substituent is present, an unsymmetrical aryne will result, and at least two products (and sometimes three) can potentially form. In the example below, attack of NH3 at carbon A results in the ortho product, and attack of NH3 at carbon B results in the meta product. So how do substituents on the ring affect addition to the triple bond? Since the aromatic pi-system is at right angles to the triple bond, what’s NOT relevant is the ability to donate a lone pair to the ring (like OCH3) , or accept a lone pair from it (like NO2). However, inductive effects are still relevant (i.e. electron-withdrawing effects that occur through single bonds). Why? 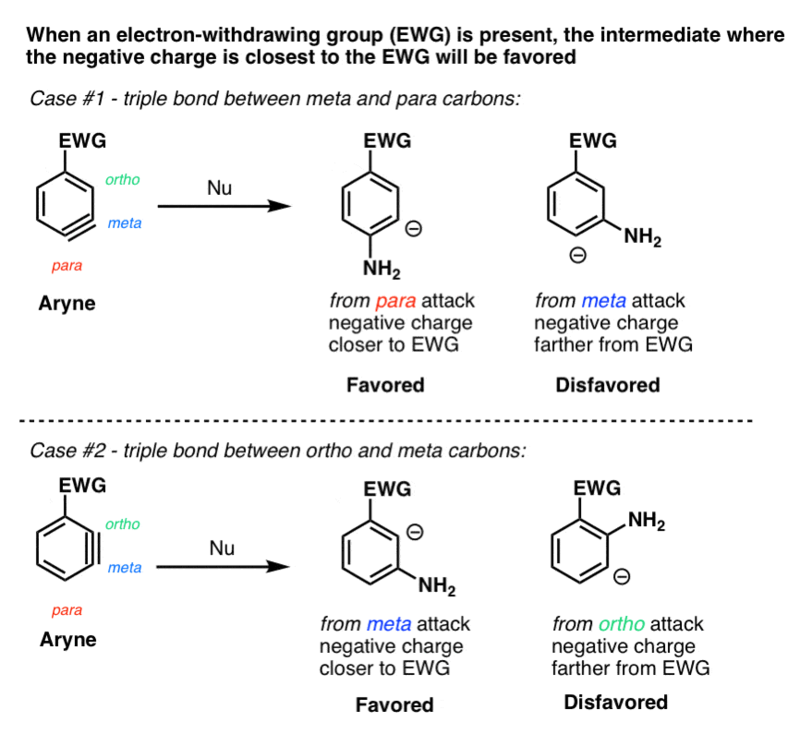 Addition to the triple bond creates a negative charge on carbon, and electron-withdrawing groups stabilize negative charge: the closer, the better. So a key principle in the addition of nucleophiles to arynes is that addition tends to happen so as to place the negative charge closer to an electron-withdrawing substituent. When the triple bond is between the meta and para carbons, attack will favor the para product, since the negative charge ends up on the meta carbon (closer than para). Note that this only applies for electron-withdrawing groups like CF3, not electron-donating groups like CH3 or alkyl. What’s interesting is that OCH3 behaves like an electron-withdrawing group in these examples, since the oxygen lone pairs can’t interact with the triple bond. See the footnotes for some more examples. For many years benzyne defied attempts at isolation and characterization, its existence inferred through trapping experiments with nucleophiles or dienes. It lives fast and dies young. Eventually, benzyne was trapped at 6K (i.e. six degrees above absolute zero) in frozen argon and studied through various spectroscopic methods. The triple bond is about 1.26 Å, longer (and weaker) than that in ethyne (1.20 Å) and the adjacent C-C bond is about 1.39 Å , slightly shorter than that in benzene. (See reference). All the other C-C bonds are within 0.01 Å of the bond lengths in benzene. There is one final type of aromatic substitution reaction for us to consider – a family of reactions called the Sandmeyer reaction that uses nitrogen gas (N2) as the leaving group. More on that next time. When an aryne is made from p-chlorotoluene, a mixture of para and meta products is obtained. When an electron-withdrawing substituent like CF3 is used instead of CH3, more of the para is formed – about 60:40, favoring the para. (Statistics would favor the meta by 2:1). This is because attack at the para position places the negative charge closer to the electron withdrawing group. With the ortho-series, the results are even more dramatic. With CH3, about an equal mixture of ortho and meta products is obtained. With CF3 and OCH3, only the meta is observed. Benzyne can be generated in several other ways besides deprotonation with a strong base like NaNH2 or KNH2. Another path is to generate a leaving group that can leave irreversibly as a gas, like CO2 or N2. 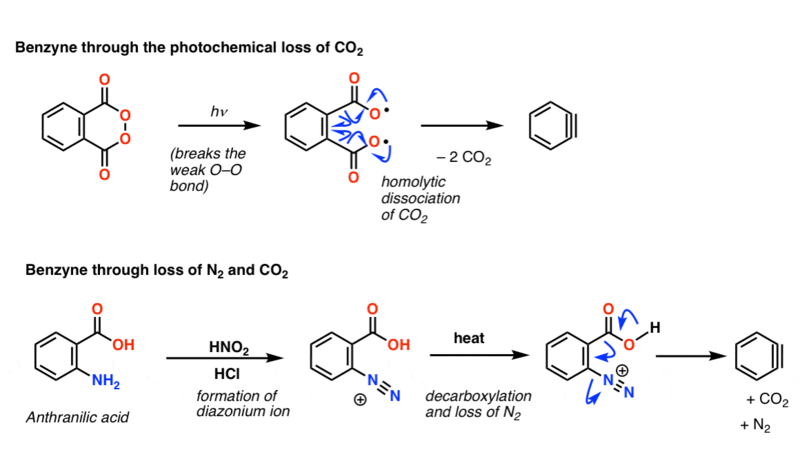 In the first reaction below, UV light breaks the weak O-O bond, and then homolytic dissociation results in loss of two CO2 molecules to give benzyne. This is just the tip of the iceberg. For more reading, this presentation on arynes by Eric Welin of the Macmilllan group at Princeton is an excellent introduction. Today, the results of Roberts’ labelling experiment could be determined in about 5 minutes through a technique called Nuclear Magnetic Resonance, or NMR. But in 1954, this technique didn’t exist. So it was necessary to determine the ratio by breaking the products down into simpler components via well-understood chemical reactions, a technique known as “degradation”. Aniline was converted into phenol through diazonium salt formation and substitution with water. Hydrogenation with Raney nickel under high pressure gave cyclohexanol, which was then oxidized to cyclohexanone with chromic acid. A Schmidt reaction converted cyclohexanone into a lactam, which was hydrolyzed to the free acid. A second Schmidt reaction then liberated CO2, which was trapped with barium hydroxide. The radioactivity of the CO2 and the diamine products were found to be roughly equal (and each about half of the total reactivity of the acid precursor), thus confirming that attack of the nitrogen occurred at two different carbons. Our chemical ancestors had to perform the labor of Job just to get a structure. The person who did more than anyone else to develop and popularize the use of NMR as a technique for structure determination of organic compounds, and thereby free us from this misery? John Roberts, who began working on it shortly after this benzyne study was published. Why Are Endo vs Exo Products Favored in the Diels-Alder Reaction? I just wanted to point out what is probably a copy/paste error in your discussion of the regioselectivity of substituted arynes. 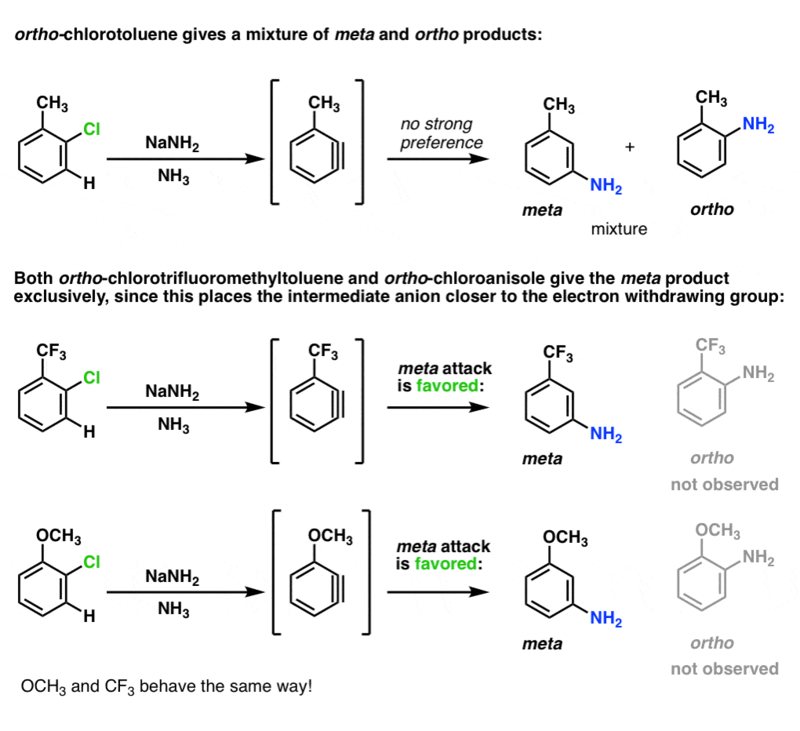 In case #2 (when the triple bond is between the ortho and meta carbons), you’ve drawn both products as having the same structure, and the accompanying text in the ChemDraw is incorrect. Oh dear. Thanks for catching that, Harold! Fixed. Hey! Mistake is still there, just so you know. Thanks for all you posts though! They’ve been a huge help! Fixed it (finally). thanks for nagging me! It looks like the 1st part of the 1st phrase is missing.